The Turkish President Recep Tayyip Erdoğan’s efforts to remake Istanbul’s Taksim square, once an emblem of Turkey’s modern life, is highly symbolic of Erdogan’s reign taking over Turkey’s republic, according to analyst Soner Cagaptay, the New York Times reported on Friday. Following the 2013 Gezi Park protests, the biggest demonstrations against Erdoğan since he came to power in 2003, Erdoğan stepped up plans to change the design of the Taksim square. Following the protests, the park was left to decline, while Erdoğan pushed plans to build a mosque in Taksim square and ordered the razing of the Ataturk Cultural Centre, an acclaimed modernist building and one of the city’s favourite institutions, according to the New York Times. Though few Turks oppose the mosque, the symbolism of a house of worship dominating the monuments of Turkey’s founder Mustafa Kemal Atatürk’s secular republic is not lost on Istanbul residents, the New York Times said. According to Çağaptay, Erdoğan wants to shape Taksim square, a popular city centre and a symbol of the modern republic founded nearly 100 years ago, in his image. Taksim square is also a popular place for demonstrations and protests. This month the Turkish pro-government media and Erdoğan accused thousands of women who gathered on Istiklal street to celebrate the International Women’s Day for booing the call for prayer made in nearby mosques. 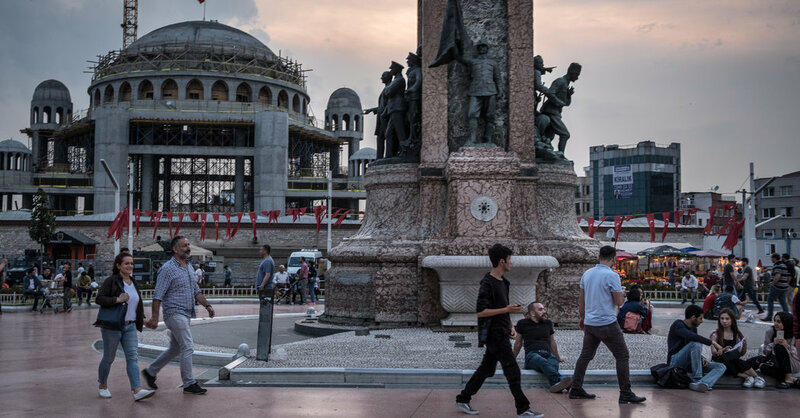 “Taksim is a symbol of progress, labor and modernism,” said Mücella Yapıcı, secretary of Taksim Solidarity, a group that campaigns to guard the square’s protected status. The government’s aim is to privatise the square by implementing Erdoğan’s original commercial project, Yapıcı said. Yapıcı is among 16 suspects - actors, lawyers, activists and journalists - the Turkish prosecutors demand a total of 47,520 years in prison on charges of attempting to violently overthrow the government by organising the 2013 Gezi protests. This popular urban patch has been a symbol of the secular republic for nearly 100 years, but six years after deadly protests there, contentious changes have begun to alter its character in major ways.